Gastropub tucked down a residential street. There were a few people in to eat on our early Thursday evening visit. This was one of the most limited selections of real ale we found in Oxford. But, the choice of 3 was varied and unusual. Loose Cannon Gunner's Gold & Abingdon Bridge were supplemented by Cloudwater Mild. The barman was happy to chat and despite being modernised, there are still some original features, such as stained glass and leaded windows in the entrance. Worth seeking out. Newly reopened after a saga of an attempt to get it up and running again. The results, on first viewing, are impressive and the ale selection was superb - with Abingdon Bridge represented and a luscious sounding porter. The food menu also looks cracking with roasts of a sunday and breakfasts and coffees on the menu as an alternative. Hipster oriented like other local institutions such as Oxfork, the Magdalen Arms, Oli's Thai and Truck records' Keen Bean coffee - but it's none the worse for that. A highly welcome addition to the local scene. Nice local pub with friendly staff and a good repetoire of live jazz/folk, fairly good selection of real ale and a big beer garden with smokers' marquees. Post code for this pub is wrong.It should be OX41SN and is in East Oxford rather than Abingdon. 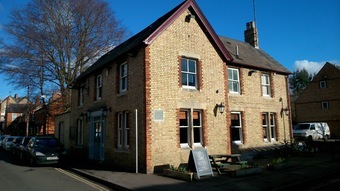 Pleasant unpretentious pub with good beer and good value lunchtime bar food. Friendly and willing service. The sunny garden could do with a bit of a facelift.